The FCNS Child Development Lab is proud to announce it has received the Family & Community Engagement Award of Excellence through ExceleRate Illinois. NIU’s CDL is one of 26 programs out of an eligible 1,300 across Illinois to earn this award. The CDL received the award at a celebration during the McCormick National Early Childhood Leadership Conference May 17. In earning this Award of Excellence, NIU’s CLD demonstrates the excellent staff practices, attitudes, and knowledge related to working with families. Research indicates that families have the greatest impact on their children’s development. Early childhood programs, such as the CDL, that are responsive to families and engage families in their children’s learning will have the best chance of shaping positive outcomes for children in their programs. Early childhood programs that build responsive and strength-based relationships with families may increase the likelihood of families becoming engaged in their children’s learning experiences as well as involved in the early childhood program itself. NIU’s Child Development Lab is a teaching and research facility for child development and early childhood professionals sponsored by the School of Family and Consumer Sciences. 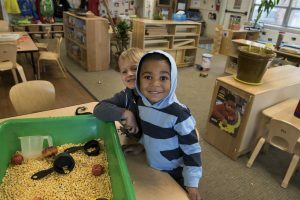 Accredited by the National Association for the Education of Young Children (NAEYC), the laboratory provides inclusive, full-day, mixed-age child care in a nurturing and supportive environment. For further information regarding the Child Development Lab, please visit the website at: chhs.niu.edu/cdl/ or call 815-753-1150.